Pullout caddies provide a convenient method of reaching the items on the back of a shelf; the shelf comes to you! Pullouts come in many sizes and a few different materials. In many houses and small apartments, we are not provided with larger kitchen area. To accommodate things in a limited space can be tricky and messy. However, the maximum utilization from small space is possible with the help of pullout caddies. The caddies are multipurpose and sleek cabinet that gives your kitchen, organized and classy look. The caddies provide a convenient method of reaching the items on the back of a shelf; the shelf comes to you! The trays of pullouts are sturdy and glide over smooth ball bearing slides. It provides effortless access to your cutlery, utensils, spices, or other accessories. Pullouts come in many sizes and are also available in different materials. Mostly trays are fabricated with durable metal or hardware. 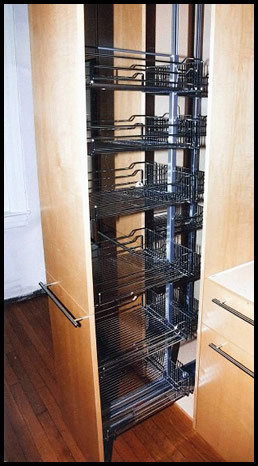 Multiple units can be installed in a cabinet depending on the requirement.